Here's the truth. I want to travel the world and eat chips. When I'm on vacation, I enjoy eating. Including fine snacks purchased at the local mini-mart or 7-Eleven. 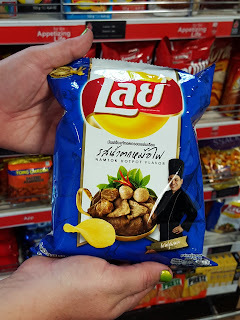 On our recent family trip to Myanmar and Thailand, my sister and I were on the lookout for chips...in addition to all the elephant pants in all the land. I think I came home with the fewest pairs of pants. 1 pair of elephant pants and 2 pairs of elephant shorts - since I live in a tropical climate. I digress. This should be all about the chips. Not pictured are the chicken satay and scallop butter garlic chips that made it through 4 airports and the longest Saturday ever of flying. Potato Fritter - Purchased on a quick escape from our horse cart in Myanmar. 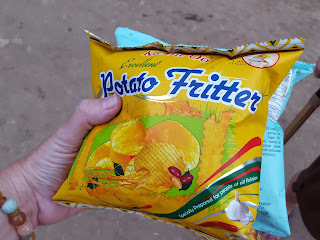 After eating these, they are henceforth called Mouth on Fire Chips. 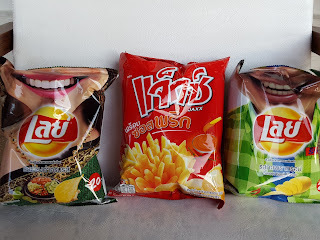 Chiang Mai Corner Mini Mart Assortment - The first bag of Lays has no English whatsoever. The best vote from my friends on Facebook was Creepy Lip Flavor. In reality.....lime and something else. 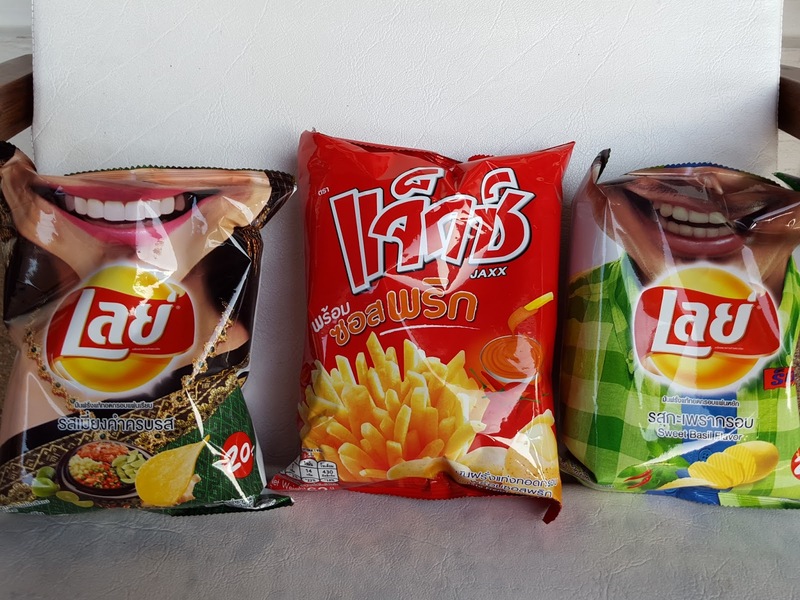 The center bag was french fries with chili sauce. The chips were shaped like fries and the chili sauce came in a separate packet. The bag on the right was Sweet Basil. It was hard gauge the flavor since there were only 6 chips in the bag. Really. Namtok Hotpot Lays - A tasty find in the Chiang Mai Airport and a solid accompaniment to our iced coffee. I'm guessing that the man on the label is a celebrity chef. Is it just me, or are Hotpot flavored chips in short supply in the US? What's your favorite way to snack on vacation?